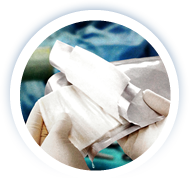 Promethean Life Sciences creates allograft skin products for healing chronic and traumatic wounds and reconstructive surgery applications. Promethean's grafts help heal patients and are cost-effetcive solutions for hospitals and patients, alike. Promethean is developing a wide range of medical products. Contact us if you are interested in partnering. © 2019 Promethean. All rights reserved.